All forms of precious metals silver gold and platinum bullion products (bars and coins) on the Allocated Bullion Exchange (ABX) have their own individual and unique physical specifications contract. The need for having individual contract specifications for each precious metals product is a must-have requirement for all parties involved with any single trading action they are associated with on the Allocated Bullion Exchange which is why each trade is instantly cleared using the ABX’s central clearing facility. Why Need Precious Metals Silver Gold Specifications Contracts? The primary reason for the physical precious metals silver gold and platinum specifications is that every trade on the Allocated Bullion Exchange is a legal business trading contract between all of the participants of that respective trade. This was incorporated as into the ABX during its concept and design phase. As it is a legally binding contract, it is necessary for all of the relevant details (i.e. the small print) that form the binding agreement to be clearly laid out prior to the parties committing to the trade irrespective of which global market is traded upon. The purpose of contracts isn’t for when things are going right, it’s for when things go wrong. So if you bought an item of precious metals silver gold or platinum bullion from the ABX and it didn’t match the description of what you bought when gets delivered to you, then using the physical trade contract specifications as a reference point, you can bring a case against the exchange for breach of contract. The specifications in each contract details all the aspects of the respective bullion item so you can easily determine if what you have bought matches what you expected. So what this basically means is that everyone sees what they need to know before they sign up for the deal and do so with open eyes. No monkey business allowed! For all of the specifications for each physical bullion item on the Allocated Bullion Exchange see our up-to-date product brochure / catalogue. Each product’s specification has been broken down into 8 standard sections in order to give uniformity across the various contracts. 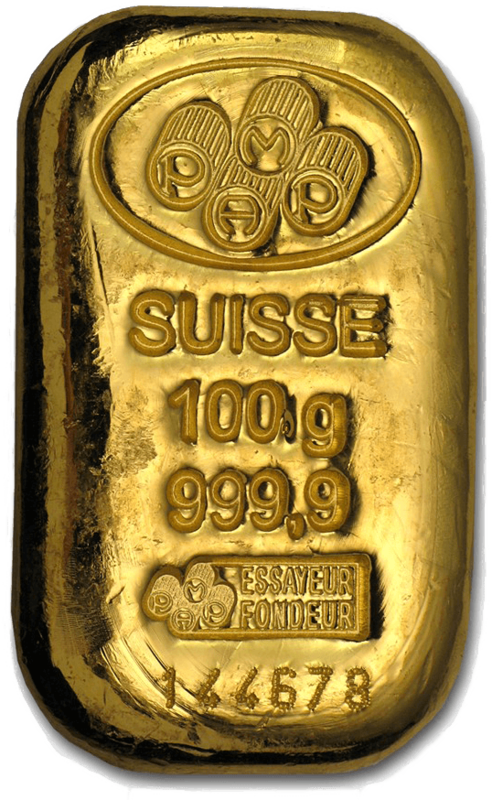 Description 100 gram (3.215 fine troy ounces) Swiss cast gold bar, of minimum fineness 999.9, and bearing a serial number and identifying stamp of as per Appendix A Good Delivery Refiners. The 'Appendix A' mentioned in the Description section of the table can be found in our bullion brochure. This part will focus on explaining the various headings and the typical specification entries. Any specifications that are odd or different will be given further explanation within that particular bullion item’s page. Follow this link to see the full list for all of our silver, platinum and gold investment grade bullion. This part gives you a brief overview of the physical item. The list of Good Delivery Refiners are approved by ABX for their international reputation, consistent quality and ability to deliver the product. The sizes are actually the weight of the bullion product not its dimensions. The weights are displayed in either imperial or metric measurements (i.e. Grams & Kilograms or Troy Ounces). ‘Fine’ refers to when the purity of a precious metal exceeds 91.667% (which is approximately 22 carats). For the above contract example for the 100 gram gold bars,the fineness is at a minimum of 99.99%. For the detail hungry, if it’s less than 91.667%, the gold bullion would have been referred to as a Standard Troy Ounce. These definitions are hangovers from days of old when we used to ride around clad in metal on the backs of horses whacking each other with swords and maces. There are 2 currencies eligible to be used on the ABX; US Dollar and Australian Dollar. The Allocated Bullion Exchange endeavours to have all product items available under both currencies. In this section it tells you which currencies you can trade them with. All items are quoted in Troy Ounces, even if their total listed size is metric. The reason for this is that the precious metals silver gold and platinum markets are still led by the West and they quote their bullion in Troy Ounces. In the not too distant future, China (Shanghai Gold Exchange) will wrestle leadership away from the West and because they prefer metric, you will see this change most likely into Grams. Basically, you will always see listed here the size (weight) of the complete unit of the bullion product you are looking at. You can’t withdraw half a bar or coin because no-one at the ABX is going to saw it up for you. If you want to chop up your gold, you do it in your own time after you've taken delivery of the item. For those considering withdrawing their bullion see our main fees page for the associated costs.